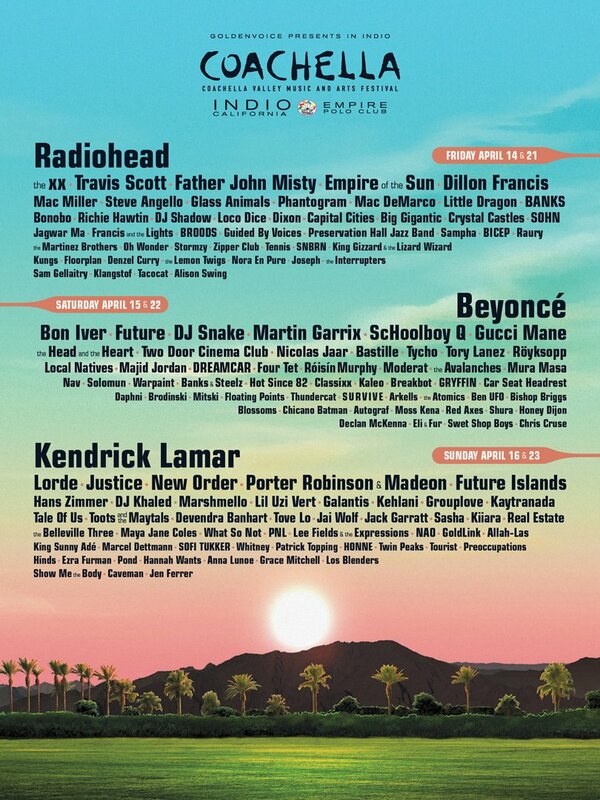 Article: Beyonce, Kendrick Lamar, Martin Garrix, The Atomics And More Bring Excellence To This Year’s Coachella Line-up! With the excitement of the new year comes the greater excitement of all of the highly-anticipated music festivals that are only months away. One music festival that is certainly all the rave and is a trending topic from now until way after the music festival actually ends is the renowned Coachella music festival, which just so happened to release its epic and stupendous line-up of performers yesterday. This year’s Coachella music festival brings a host of sensational, internationally-acclaimed, musical phenomenons and everyone is totally going crazy over just how incredible this year’s line-up is. Get ready to be left mesmerized as the one and only Beyonce, Kendrick Lamar, and Radiohead will be headlining the music festival. Spectacular performers including Martin Garrix, The Atomics, Lorde, Kehlani, Mac Miller, Dillon Francis, Future, ScHoolboy Q, Gucci Mane, DJ Khaled, Marshmello, Tove Lo, and many more will be bringing Coachella attendees to another musical atmosphere and will be giving everyone three days that they will never forget. Needless to say, this year’s Coachella is bound to be unforgettable and we can’t wait to see all of our favorite musicians jam out and bring extra heat to the desert! Comment below and tell me or tweet me at @alexisjoyvipacc, who are you most excited to see at this year’s Coachella music festival? Next Article: Rio Mangini Released A Brand New EDM Single And It’s Incredible! Listen To It Here!